Guess what just happened over here? I drew (Or should I say REMEMBERED to draw!?) the winner of our October Quilty Box Gift-Away! The October Quilty Box is curated by none other than Leah Day, someone I love and admire for all of the wonderful fun she is! If there is a box full of Leah Goodies, I want one! Just take a look at everything in this awesome box! 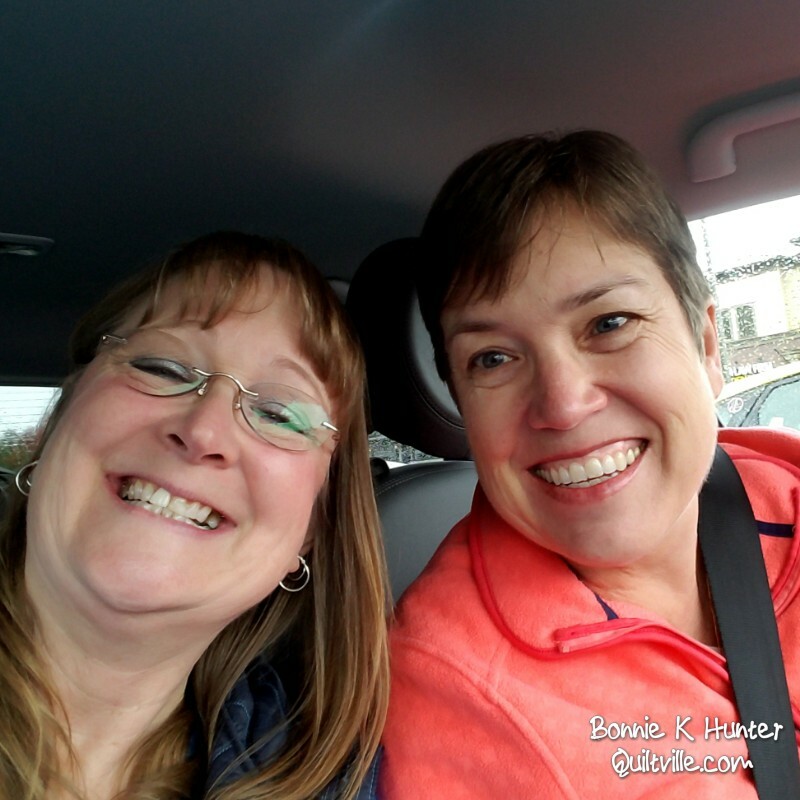 Quipped by Bonnie K. Hunter at 8:01 PM 11 Snips & Comments by others! When you have been gone for more than a week and there is so much to post about. Just WHERE do you jump in to pick up where you left off? I’m not sure I can! I walked through my front door at about 5pm last evening, and yet I felt like a different person visiting a distant memory. Traveling will do this to you. You come back a different person with wider views than when you left. So I’ll start here. With the funny Terracotta Warrior photo ops that Jill and I had outside of the Terracotta Factory outside of Xi’an. Do Jill & I have our fierce warrior faces on or what? Quipped by Bonnie K. Hunter at 10:32 AM 28 Snips & Comments by others! Saturday: The Long Journey Home. As of a couple of hours ago, I realized that I had been going going going for something like 36 hours –a double Saturday of travel. We left the hotel in Xi’an for our flight to Beijing at about 10:30 am. 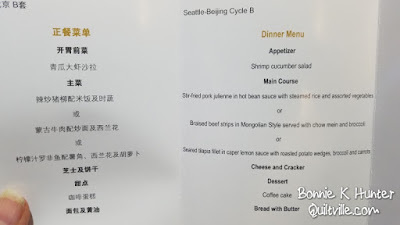 Our 3 hour layover in Beijing was NOT NEARLY LONG ENOUGH for us to get from one terminal to the baggage claim, pick up luggage, take it back through customs and then to the ticket counter to get our tickets for our long flight to Seattle. It didn’t help matters that they thought there was something suspicious in my bag – I assumed it was the power converter, but no – the guard lady kept insisting I had a lighter in my bag. I don’t. I don’t smoke. I have never smoked, and I would not be dumb enough to try to fly with something combustible in the checked luggage. Phone power banks were with me in my back pack. I had been so careful. Now that is not such a problem for me. Always better safer than not. But by this measure, our own TSA security here in the USA looks to be a bit on the lazy side! Quipped by Bonnie K. Hunter at 6:37 AM 25 Snips & Comments by others! 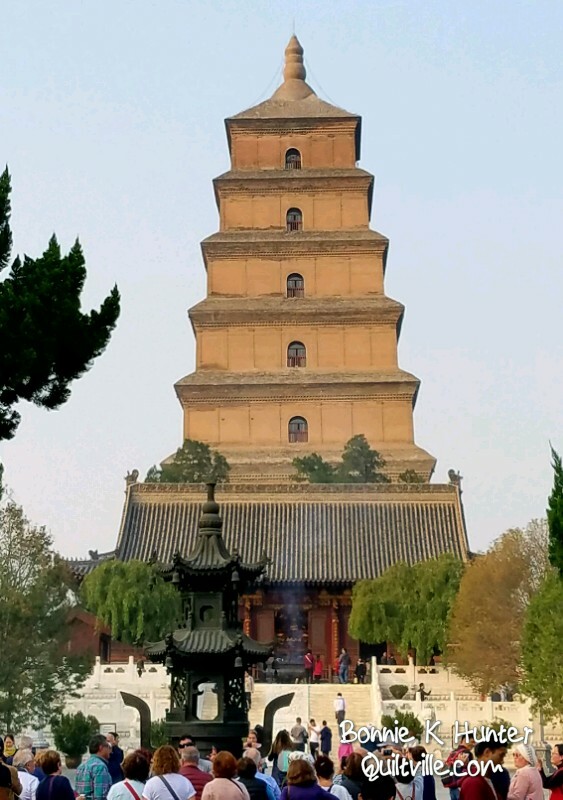 Even in the midst of millions of people, you can still find a place of peace and reflection by visiting the Great Wild Goose Pagoda and surrounding gardens. Quipped by Bonnie K. Hunter at 5:42 PM 14 Snips & Comments by others! 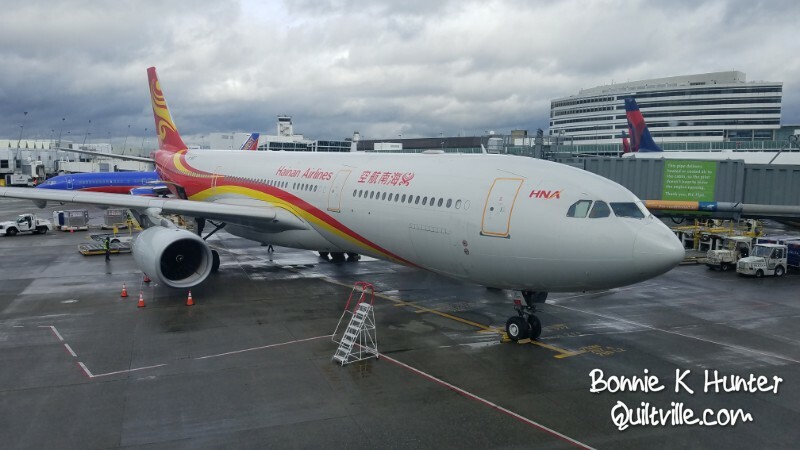 Yesterday was just a day to get from Beijing to Xi'an. It took longer than we thought! Our flight was delayed out of Beijing by somewhere around 2 hours. They fed us breakfast while waiting in the airport. Breakfast consisted of things like a soy sauce pickled egg, pickled cabbage much like kimchi, some rice cracker cookie things, a yogurt, and something else I can't remember or decipher just what it was! Quipped by Bonnie K. Hunter at 6:26 PM 5 Snips & Comments by others! 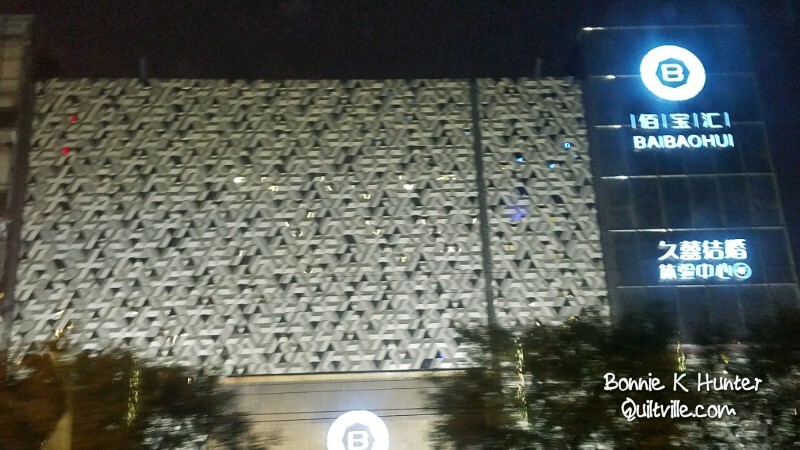 It's very early in Beijing right now, my alarm went off at 4:30 a.m. and we will be off to the airport shortly to catch our flight to Xi'an. The Terracotta Warriors await! We've had a couple quilting sessions so far, one evening one and yesterday's morning one are seeing everyone closer to completing one of the seven hexie stars they will need to complete the center medallion. Quipped by Bonnie K. Hunter at 4:34 PM 9 Snips & Comments by others! Our Great China day couldn't have been any better! Blue skies, very little haziness, temperatures just perfect and plenty of sunshine! I know this is not the usual experience but we will take it! Quipped by Bonnie K. Hunter at 7:24 PM 17 Snips & Comments by others! Whoever said that the sun never shines in Beijing was completely wrong. 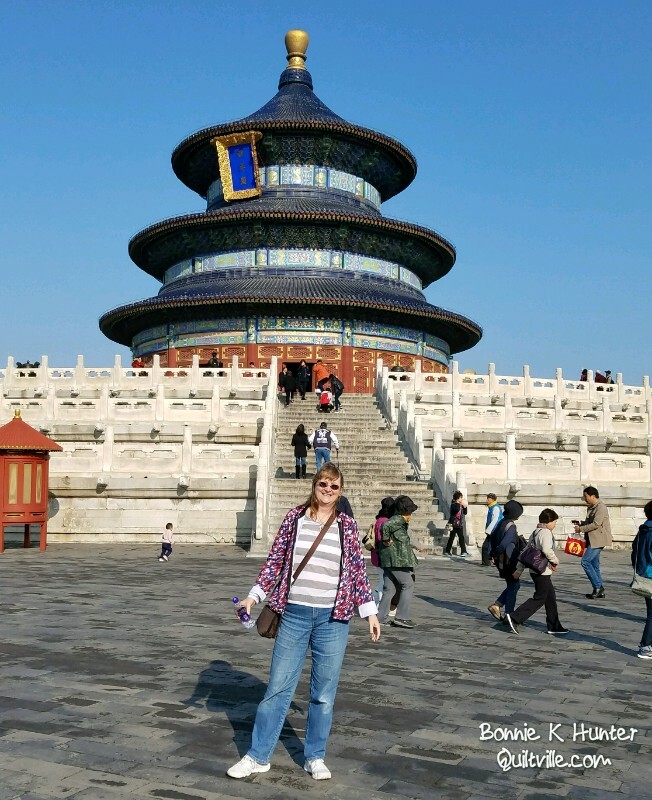 It was absolutely the most beautiful day yesterday, and what better backdrop for the colors found in the Temple of Heaven than a blue blue sky beyond! Standing an ancient places has always had a soul centering effect on me. We tend to think the world is all about us, the here and now. As if we are the only generation that has ever counted. But when I stand in these places that are centuries old, I realize that we are just a micro speck on the timeline of this planet. I wish I could know these people. And see how they did things and how they lived when this Temple was built. Everywhere you turn is a feast for the Quilters eyes! Quipped by Bonnie K. Hunter at 3:55 PM 6 Snips & Comments by others! Yesterday was full of amazing sights, sounds, smells, and experiences. And don't forget the tastes! It's hard to put into words how it felt to be standing in the center of Tiananmen Square. The first time I ever heard about Tiananmen Square I was much younger, and didn't understand things of the world. I guess I still don't in many ways. Surreal is the only word I can come up with. There will be much documentary watching over the next several weeks upon my return home to the land of streaming internet. I'm sure there are a lot of things that can be found on Netflix or on YouTube to fill in the quick education I'm getting while being here. Quipped by Bonnie K. Hunter at 4:39 PM 12 Snips & Comments by others! Does anyone know what the little net things are in the left hand side of this photo? in my early years, when I had one small child and a hubster in college, I worked as a floral designer at a local flower shop in Ontario, Oregon. My favorite place was in the cooler! I loved opening the many boxes of fresh cut flowers that were delivered daily, and they had to be unpacked, ends of stems trimmed just right and set in buckets of water in the walk in cooler to keep them fresh as we worked with them. The aroma that came from that cooler still comes to mind any time I am hear a flower shop. Delicate flowers like spider mums come with their blossoms protected by these little net “socks” that are ALWAYS discarded when the flowers go into arrangements, if not before – allowing the blooms to relax. Here I have cut one of the socks in half – and have slid it over my Aurifil spool for travel purposes. I don’t like it when my thread goes tangly at the top of the spool. The sock helps keep it nice and neat in my bag and I can pull just enough thread off of the spool with the sock still on. If you’ve got unwieldy thread, give this a try! Quipped by Bonnie K. Hunter at 8:00 AM 19 Snips & Comments by others! Wee Small Hours in Beijing! Hello from me and my friend Jill! I snapped this photo when she picked me up at my hotel which seems like days ago and a whole world away! It was an extremely long travel day and though I have been able to connect with the VPN and the hotel WiFi on my phone, I can't seem to get the laptop to connect. So here I am throwing up some photos by email to the blog. This may limit what I am able to share while I am on this trip, but it will give us enough connectivity so you get a glimpse of what is going on here. Our plane! We flew Hainan Airlines, and it was a great experience. The seats were quite roomy and actually had almost 2 inched more seat space than the US Airlines have. We also upgraded our seats for a little bit more leg room in an exit row! Jill and I are both tall girls and we're grateful for this upgrade. The food was great! No complaints here on that front either. I love anything with sesame oil, and this was delicious! Evidently the airline also knew that I would be working on hexies and made sure that the in-flight entertainment screen matched what I was working on! The flight was nearly 12 hours long, and after about hour five you really are pretty much done with this flying thing. Sleep is nearly impossible, as we chased the sun the entire way. It never got dark the entire 12-hour flight period after landing and going through customs and picking up our luggage and meeting our guide, we finally walked out into the evening Darkness as we boarded our bus for our hotel in Beijing. This hotel room was such a welcome sight! We only had enough time to drop off our bags and get ready for our group dinner in the hotel restaurant. 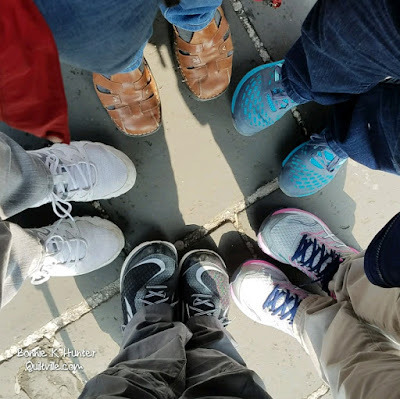 I've got a wonderful group and I can't wait to start exploring Beijing today. After dinner Jill and I took a short walk to find the ATM. We saw several different kinds of street dancing happening on our walk through the shopping district. I have shared these videos to my Facebook and to my Instagram but I can't embed them here because I am uploading this by email. I am suggesting that you follow my Facebook and Instagram feeds so that you don't miss out on these little video clips and any other photo shares from our day in between blog posts. Posts will be coming at crazy times as I am able. News from the home front: the hubster is with his family in Payette, Idaho having arrived yesterday. Hospice has informed the family that my father-in-law is likely to not make it through the weekend. He is surrounded with much love and now covered in my quilt. And all we wish for him is a gentle and peaceful passing. At this time we are thinking that instead of me returning to North Carolina after landing back in Seattle, I will instead fly directly to Boise for the memorial service and then go home from there. It's too much to think about right now, and my heart is hurting that I am here instead of there. I feel so very torn. However, my father-in-law knows of my trip and was excited for me to do this so I am carrying his love with me in my heart. Thank you so much for your extended prayers and well wishes for my family while I am so far away. Quipped by Bonnie K. Hunter at 5:06 PM 14 Snips & Comments by others! 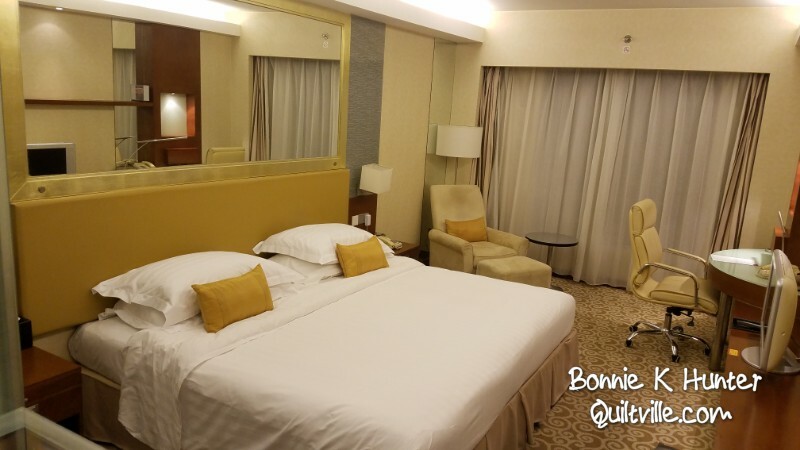 I’m writing this post from my hotel room near the Seattle airport – body clock still on East Coast Time, and up at the ungodly h our of 4am Pacific time. I tried forcing myself back to sleep, but that just doesn’t fly. So after talking to family on the East Coast, busy with their normal Friday lives, I got up, grabbed a shower, made sure everything was packed the way it should be, checked and double checked all of the documents that go with a person when traveling to way far away lands, opened up the curtains to my 6th floor room to find – dark. It’s still dark. Of course it is! It’s only 7:30am here and I am much farther north than my North Carolina home. Too early to walk up to the Denny’s for breakfast – and I feel like writing so here I am. I should have waited to take my next round of antibiotics for the stow-away tick and its bite for when I had food for my stomach, but NOOOO…I didn’t think of that. There was a package of almonds in my bag from yesterday’s cross-country flight. Hopefully that will stave off the tummy upset I feel coming on. For those who emailed asking about the bite – it’s healing, and the antibiotics are to make sure I don’t come down with Lyme. I’ll have it checked again and perhaps a blood test done when I get back. I am still covered in creepy crawlies when I think I was host to that bugger for at least 3 days and brought him HOME from New York. 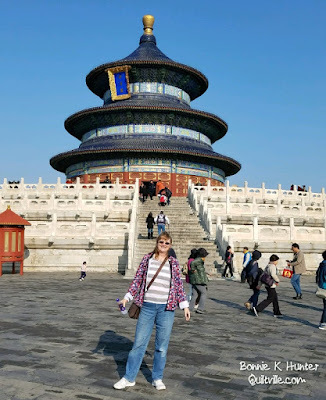 This little goodie box arrived on my doorstep while I was teaching up in New York last week, and I thought it would be just perfect to let it loose as a gift-away here on the blog while I’m in China! If this box is full of Leah Goodies, I want one! Latifah Saafir is November’s box girl! www.latifahsaafirstudios.com. I am all about having 5% going to Quilts for Kids while I get a bunch of quilty goodness to play with in every box! 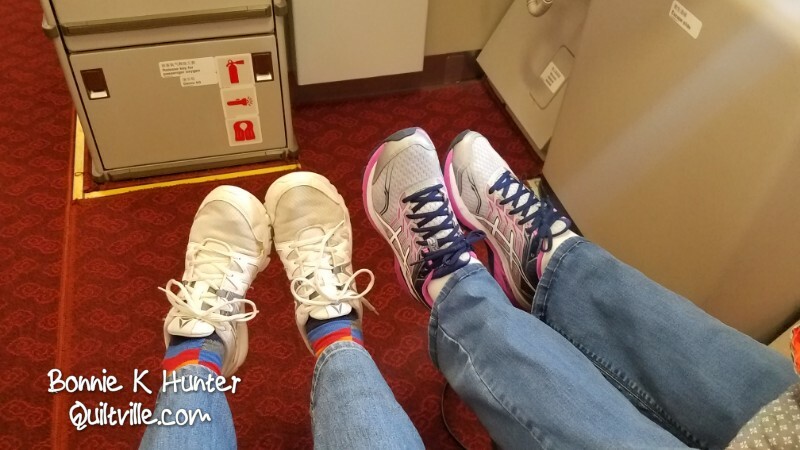 These are my happy feet as I head out to the airport today! Aren’t these just so cute? The crazy thing is, they were ridiculously on sale, through some website that I clicked through to find. I can’t remember the name of the site! And when these showed up on my doorstep there was no invoice in the package. A drop-ship from the manufacturer most likely ---in CHINA! They not only look super quilty, but they are woven elastic so they hug your feet as you walk. I bought two pair. One in blue, and these in black. This pair is going back to the land of its birth for a visit. LOL. A girl who loves her Mary Janes will never get tired of Mary Janes, even into her mid 50s! There is no label inside to give me a brand name, nothing. Oh, fabulous shoes – I’d love more of you but I guess the only way to go searching is to scour paypal from whence the charges were applied. I’m on my way to Seattle. My job today is just to GET THERE. 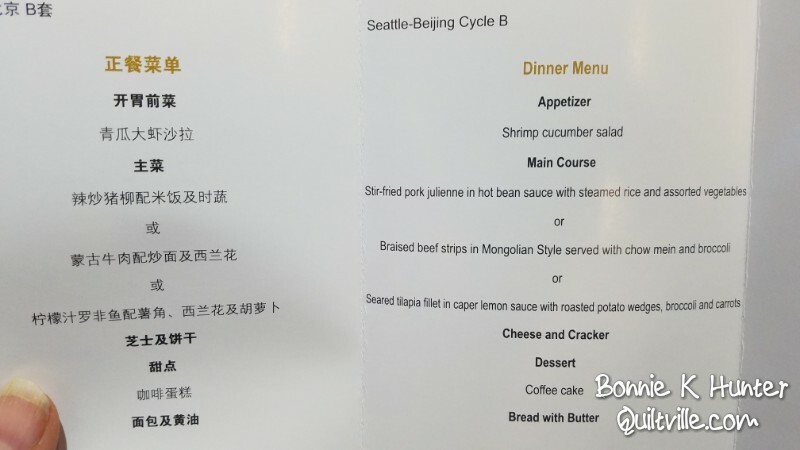 The flights were such that if I flew tomorrow, and there was a hiccup at ANY part of my journey from North Carolina to Seattle, that I would likely miss the flight to Beijing. That happened on a trip to Ireland a few years back, and it is NOT going to happen again. I’ll go a day early. The crown is back again where it belongs – I asked the dentist for the “more than 10 day” glue. He laughed. I can honestly say living in a place for 10 years really does put down some roots. And root canals. And I feel like these people are part of my tribe. My heart belongs here. Quipped by Bonnie K. Hunter at 7:04 AM 37 Snips & Comments by others! I’ve got to head out for the dentist in about 20 minutes so I am throwing this up here as quickly as I can. Oy! Yesterday! It seems that Monday is still on going. Truth is, I couldn’t feel a thing…and she ended up drowning the sucker in eucalyptus oil and was able to remove him (her? it?!) with the corkscrew rotation method. After the massage I went straight to the chiropractor, and the creep-out continued! Quipped by Bonnie K. Hunter at 8:43 AM 15 Snips & Comments by others! Rainy Days, Mondays–It’s All Small Stuff! This was me last night at the end of a very long day of playing catch up. These days never go smoothly – imagine it. You’ve been gone for a week, mail is piled up, you find that everything on your to-do list of things you wanted to get done before the next big trip (CHINA!) have shifted to afterwards and you are trying to get the word out to those who were going to be wondering just what was up and where was their package – and it snowballs. Not in a complaining way, just a throw your hands up in the air and keep laughing because it’s now been dubbed the DAY OF RIDICULOUSNESS! Quipped by Bonnie K. Hunter at 9:16 AM 36 Snips & Comments by others! I’m Home! And a Bit of NY Show & Share! Boy do I have a treat for you today! There was so much wonderful showing and sharing happening with both guilds that I’ve visited in the past week. But before I do – I need to make a little announcement, so bear with me. I was intending to ship all of these BEFORE leaving for China on Thursday, but they won’t be here in time due to a manufacturing delay. It happens. They will likely arrive the day I leave – Thursday! So I am putting this out there to let you know what the hold up on the order is. I am sorry, but it is beyond my control and I will get your orders out as quickly as possible upon my return home. 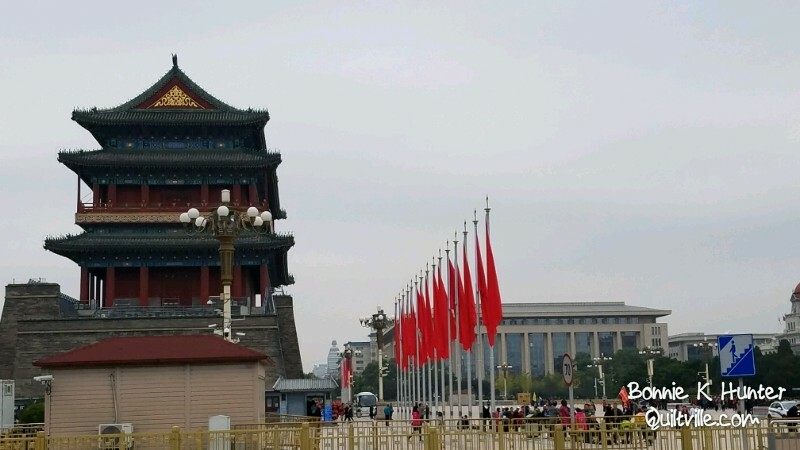 You WILL however receive an email that your order is “PROCESSING” which simply means I have batch printed the invoices so that I can send the orders that do NOT include that ruler, setting your invoice and label aside for quick processing when they are in house and I am back from China. I will be posting this info to ALL of my social media hoping to reach the masses as quickly as possible so they have a heads-up. Thank you. Now back to the quilty good stuff! All of the glorious show & share from my trip to New York! Huge crowds and loads of show & share happened! Not only at the lectures, but at the workshops as well! There were so many mystery quilt finishes – they filled the room with happiness all around! Excitement is building for this year’s upcoming mystery. 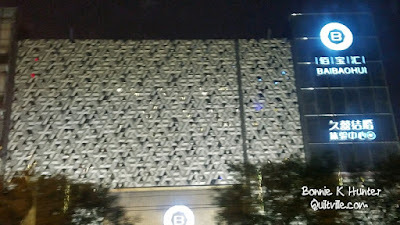 Colors and yardage info and more will be posted HERE on the blog when I return home from China. Check out Norma’s Vintage pieced hexagon quilt! We ALL fell in love with this! It has fabrics from the 1930s through the 1950s! The backing was FACED as binding! The front and back border/binding where actually diamonds pieced and stitched and finish the edge on both sides. And here we think of this as a “MODERN” way to finish hexagon quilts, but this shows it was done in the 1950s at least. There is NOTHING new under the sun, and if you think you’ve come up with something new, someone else probably did too – many years ago. I was SO excited to see some Punkin’ Patch finishes from the Sept/Oct 2017 Quiltmaker issue! It was a wonderful week spent quilting with the best that New York has to offer! Remember, if you can't view the video, it is likely that you are in Internet Explorer. Please try another browser or visit my YouTube channel directly by clicking the YouTube icon beneath my signature line at the bottom of this page. My email, Facebook, instagram and other sites are linked in each circle found there as well! Yesterday was my travel home day – and I was so exhausted that I could barely make it through dinner – I was in bed sound asleep by 9pm. Today I start ramping up for China in earnest! I leave THURSDAY!? Oh, my word. I’m going to sign up for a VPN before I leave in hopes that will keep me connected. If connectivity doesn't work, just know that we will catch up when I get back! Smith Mountain Morning quilt from my book Scraps & Shirttails II. It is not up to anyone or everyone else to create your happy environment. That comes only from within you. Quipped by Bonnie K. Hunter at 9:14 AM 9 Snips & Comments by others! Texas Braid, New York Style! There are some workshops where you are lucky if you get one or two blocks done – and have a few baggies of spare parts on the side for good measure. Workshops are like that. Often they are less about the project you are making, and more about the PROCESS for success that goes into the units, having a positive impact on all of the quilts you make in the future. Each thing we learn at a workshop becomes a stepping stone to help us on our way to the next one, don’t you agree? I often teach Texas Braid as a half-day workshop, because it doesn’t take much until we’ve got the process down and are happily sewing away as we chat to new friends across the table, swap rectangles for variety and enjoy a bit of sewing time together. When it is a full day workshop, we can throw even MORE fun into the mix! Quipped by Bonnie K. Hunter at 9:38 AM 3 Snips & Comments by others! A Rochester Pineapple Blossom Day! It was a Pineapple Blossom Day yesterday! And it was wonderful to see so many blocks made during our day together – most folks were leaving with 8 or more blocks completely finished and eager to do some more! It’s great to do intricate patterns that really challenge us. We’ve got to push our boundaries. That said, it is also refreshing to do something SIMPLY SCRAPPY and enjoy ourselves while not turning ourselves in knots in the process. Simple blocks allow us to visit and chat and laugh with one another and we really enjoyed our time! Quipped by Bonnie K. Hunter at 8:07 AM 12 Snips & Comments by others! Quilting in the Genesee Valley! Things were hustling and bustling by the bus load at the October meeting of the Genesee Valley Quilt Club, founded in Rochester, NY in January 1936! Can anyone name me a quilter’s organization that has been around longer than this one and is still thriving? I’m so honored to be here with these folks –and the bus load of 50+ visitors that joined us yesterday for lunch and an afternoon of fun quilt talk from the Finger Lakes region. The business meeting starts at 10am or so, followed by show and share, and then they break for LUNCH! After lunch it was my turn to get up and share my love of scrap quilts. Quipped by Bonnie K. Hunter at 8:14 AM 16 Snips & Comments by others! Smith Mountain Morning in New York! So much happy that I couldn’t capture it in one photo! We had to shoot both sides of the room! 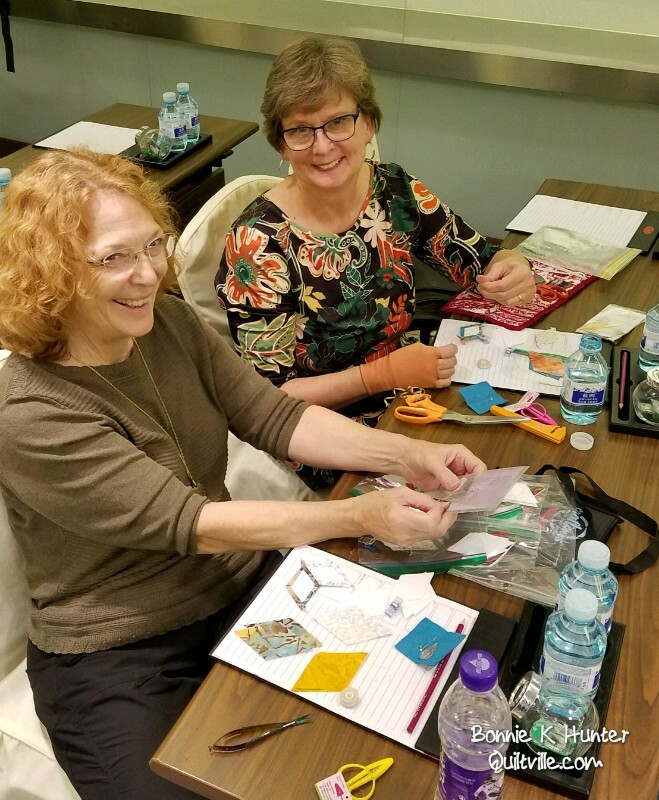 Yesterday’s Smith Mountain Morning workshop from Scraps & Shirttails II was a full-up and fun filled day, and the variety of plans and colors being made into blocks would have surely knocked your socks off! My thanks to the Snow Country Quilters of Remsen, NY and all of those who traveled in from outlying areas to participate – including one gal who had a flight snafu from Florida, ended up driving to Charlotte NC to catch a connection to Chicago and finally made it in to Syracuse to join us. Who says that quilters don’t take our stuff seriously! Some of these quilts just have so much meaning to me, and this is one of them. Precious shirt scraps, and all of my favorite units! There was a lot going on in my life during the making of this quilt, and you know what? It felt wonderful to hang it up, step back and look at it and tell myself “See?? It all turned out better than you had hoped!” Sometimes hindsight is definitely in our favor. We got to the location a bit early, and I had a couple of phone calls to attend to, and while walking around the parking lot taking care of business (Class wasn’t starting for nearly an hour) I found the entrance to a little trail and my curiosity got the best of me. Quipped by Bonnie K. Hunter at 7:33 AM 12 Snips & Comments by others! It’s warm in New York! Weirdly and wonderfully warm, as in high 70s in October? But this sight as we came to a T in the road before making a left into Remsen as we head for a bite of dinner before heading over to our lecture location last evening….beautiful. Old buildings, white puffy clouds against a blue sky, and a couple of trees trying to do their best show of autumn color. I’ll take it! Quipped by Bonnie K. Hunter at 7:28 AM 7 Snips & Comments by others! It’s still a couple of weeks until things are supposedly “at peek” And it doesn’t help that it was raining as I landed, but my heart can smile as colors emerge! I flew into Syracuse, was picked up by Roberta and I enjoyed the somewhere-around-an-hour drive from Syracuse of Utica. The trees along the side of the Thruway were putting on their best color, and it will only get better as the days go by. It was an uneventful and very quick trip, even if it meant getting up at 4am to leave the house by 5am. And I knew in the back of my head that it was okay to be a bit tired. It was just a “get there” day – and there would be an afternoon nap in m future! There was no way to nap on the flight, I was too excited! The Universal Language of Quilting! Imagine that you were quilting in a room where everyone spoke a different language, and no one understood each other. I bet it wouldn’t take long until our love of fabric, design, needle, thread, machines, tools and gadgets became a way to communicate with one another. Now imagine yourself in a seeing, yet un-hearing world. And creativity is burgeoning and overflowing! And there IS a common language – sign language! Hands are flying in greeting as neighbor meets neighbor and quilters who haven’t seen each other since last retreat catch up from across the room with a wave. Xina Crawford and her friends recently celebrated the 10th Anniversary of Deaf Quilt Retreats in September 2017 in Pennsylvania. Natalie Beckman (NJ), Mary Beth Heller (VA), Debra DaSilva (MD), Susan Hanrahan (MD), Xina Crawford (AL). “52 Deaf Quilters were in attendance. Seven of us made Bonnie's En Provence quilt this year (2 not pictured). We all look forward to Bonnie's new Mystery! This story just warms my heart! And the quilts are SO gorgeous. Xina also took a bunch of Essential Triangle Tools with her so she could demo all that it can do to the ladies in attendance. Way to spread the love, Xina! If you are interested in attending a quilt retreat especially for deaf quilters, please contact one of the many deaf quilter groups on Facebook, there may be a group that hosts retreats near you. 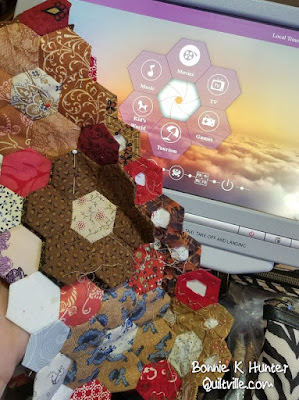 I needed more hexies cut for the 3 remaining sides of the eternal hexie project. My variety was severely lacking and to continue, I was going to need to cut more to mix in to what I’ve already got. Out came my beloved bin of scraps from Jo Morton. Remember when this box was found on my doorstep from Jo herself? I’m still pulling from it, and a lot of the contents of this special scrap box have gone into this hexie quilt. I just LOVE these yummy browns, they are so timeless! Measuring the new border start against the one completed side. Baby, you’ve got a long long way to go! I took this picture so I could refer back to how the hexies turn the corner. I also took a hexie count so I know how many to make for the opposite side. I am ready for this New York trip. Some of yesterday’s fiddle-jobs included cleaning out my purse, my busy bag, my suitcase and slimming down. I packed away the summer attire and pulled out some fall items. I packed a ran jacket because it is supposed to be wet today –and I put an umbrella in the zipper pocket of the quilt duffels. A girl has got to be prepared! I packed up those cut-out and kitted-up Rolling Stone blocks that have not been touched since the string snowball got placed on the front burner and I’ll be working on those with loaner machines this trip. These also MUST be finished! I haven’t touched this since JUNE! I last showed this photo stitching at Irene’s during my time teaching near Louisville, Kentucky. Remember my post about visiting her shop, The Cozy Quilter? Refresh your memory HERE. This little sweet Singer 99 was adopted out during that trip, and the blocks packed up and put away while I turned the ones I had sewn up “WRONG” (Or should I just say different?) in to the baby quilt I made for my nephew-to-be who should be making his debut any week now. And then life got crazy. I’m looking forward to working on these this week in between workshops and lectures. Trimming half-square triangles before pressing! Before I go - I wanted to let you know that another batch of Triangle Booty rulers have arrived and are available in the Quiltville Store! I shared this nifty gadget HERE. You can even use it this way with bias strips cut from layer cake 10'' squares! More info HERE. This is the last batch I'll be able to get out before our trip to China, the next shipment will be available around Halloween when I return. I have also added more Quiltville Eco-Pouch sets! 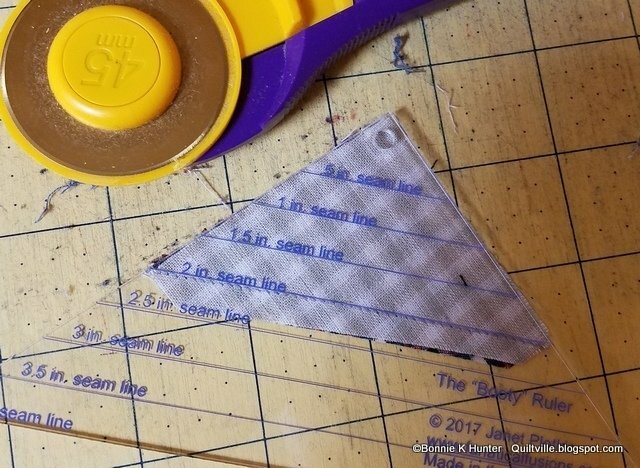 Update on the Sharon Hultgren Center Square Rulers: I talked about this during Quilt-Cam the other night, but Sharon sent an email apologizing - what she thought were 2 more case of rulers turned out to be 2 cases of books. She is still on the look out, and will let us know if she finds more. So I appreciate your patience while we continue to wait on that item. If she finds more she will let me know and I will let you know, just keep following the blog and my instagram or facebook and you'll know when I know. And language is much more than sounds we here. It is reflected in everything we do. Every action is a communication. I’m off to New York! Quipped by Bonnie K. Hunter at 4:42 AM 4 Snips & Comments by others! Trail Cam Visitors, and Quilts in the Machine! Let’s Do Some Quiltmaker Bundle Drawing!